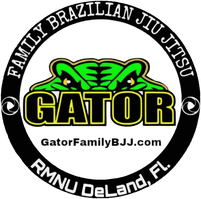 FAQ'S About training at Gator Family Brazilian Jiu-Jitsu - Gator Family Brazilian Jiu-Jitsu, DeLand Fl. Where is your Academy? We are located at Victoria Square shopping center a few doors from Gators Dockside and the movie theater. 1760 S. Woodland Blvd. Deland, Fl. What should I wear to try a free class?Comfortable shorts or sweatpants and a t-shirt. What age can my kids start Jiu-Jitsu? Our kids program for boys and girls starts at 6 years old. Do you have any women in the Adult class?Absolutely, 1/3 of our adult class are ladies. What days can I train? Our current schedule is Tuesday and Thursday. Kids at 5:30, Adults at 6:30. 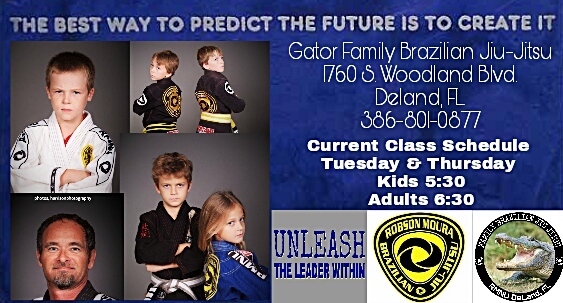 We also have open mats and field trips to train with Master Robson Moura. How much are classes? Our rates are less than $20. per class. Do I have to sign an agreement? Our Coaches and staff are 100% committed to the success of your goals. As such we require 100% dedication on your part. We have yearly memberships programs.